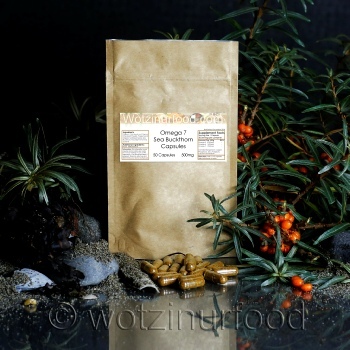 Sea Buckthorn is high in Omega-7 Fatty Acid or palmitoleic acid, which is very beneficial to reducing metabolic syndrome, which can lead to conditions like heart disease, diabetes, cancer, and other life-threatening disorders. It can lower the inflammation which causes these conditions and increase good HDL blood levels, which protect against heart conditions and plaquing of the arteries. Omega-7 can replace the need for statins and other cholesterol medicines without the side effects and dangers associated with these drugs. With the addition of Co-Q 10, this combination can work together to help with heart health, conditions of inflammation and improve signs of aging without any dangerous side effects, especially those 40 years and older. Antioxidant Health; with so many Vitamins and Minerals, the benefits improve support against free radicals which help the fight against any tumours and inflammation therefore benefiting from all-round fight against oxidation. Our Omega-7 Sea Buckthorn powder is certified organic. Digestive Health. With a massive 11 grams of fibre per ounce, chia seeds absorb massive amounts of water and act like probiotics in the stomach. Heart Health. Chia seeds help reduce inflammation and are high in Omega-3's they can help to reduce cholesterol and lower blood pressure. Treat Diabetic conditions. When fed to rats, chia seeds reduced insulin resistance and belly fat helping them to recover from diabetic conditions. Bone and Muscle Strength. Being high in minerals like calcium, boron and magnesium, they are beneficial to bone and muscle strength. Studies have shown that people with various heart conditions have had low levels of CoQ-10 in their systems, and therefore supplementing has benefited people with these conditions, including: congestive heart failure, angina, high blood pressure and related problems. It has also been used to treat diabetes, gum disease, breast tumours, Parkinson's, Huntingdon's, muscular dystrophy and chronic fatigue syndrome. We have included our CoQ-10 to help in the firming up of skin cells which tend to lose their elasticity as we age. Sunflower seeds have many benefits, one of the chief ones is to reduce cholesterol which improves heart health, and helps regulate blood pressure. Research has shown they contain natural anti-oxidants which help regulate blood sugar levels which may contribute to diabetes. The minerals in sunflower seeds also helps with osteoporosis and reduces swelling and inflammation which can contribute to arthritis. They have also been linked to helping with anxiety and have been known to boost serotonin levels. They have also high levels of Folic Acid which may help with child conception, and the development of the child. Adding sunflower seeds to our preparation encourages the uptake of Omega-6 Fatty Acids, and are high in Omega-9 Fatty Acids. Poppy Seeds are also a powerhouse of Omega oils 3 and 6 and high in oleic and linoleic acids which help lower bad LDL and increase good HDL blood levels, which protect against heart conditions and plaquing of the arteries. High in B Vitamins, they help improve metabolism and having good levels of minerals contribute towards maintaining cell health, digestion, heart and blood pressure health and improving skin generation. Poppy seeds do have a very small level of opiates, which may be beneficial to pain relief in some individuals and calming the nerves, although in this preparation they may be too small to benefit. Do not take if allergic to any ingredients. Processed in a premises which handles nut, seeds and spices.